Countess Sophia Andreyevna Tolstaya (née Behrs; Russian: Со́фья Андре́евна Толста́я, sometimes Anglicised as Sophia Tolstoy; 22 August 1844 – 4 November 1919), was a Russian diarist, and the wife of Russian writer Leo Tolstoy. Sophia Behrs was one of three daughters of a German physician, Andrey Evstafievich Behrs (1808–1868), and his Russian wife, Liubov Alexandrovna (née Islavinа; 1826–1886). 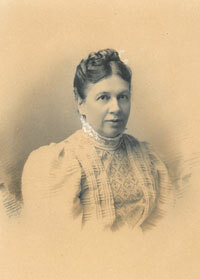 Her maternal great-grandfather, Count Pyotr Zavadovsky, was the first minister of education in Russia's history. Sophia was first introduced to Leo Tolstoy in 1862, when she was 18 years old. At 34, Tolstoy was 16 years her senior. On 17 September 1862 the couple became formally engaged after Tolstoy gave Sophia a written proposal of marriage, marrying a week later in Moscow. At the time of their marriage, Leo Tolstoy was already well known as a novelist after the publication of The Cossacks. On the eve of their marriage, Tolstoy gave Sophia his diaries detailing his sexual relations with female serfs. In Anna Karenina, 34-year-old Konstantin Levin, a semi-autobiographical character behaves similarly, asking his 19-year-old fiancée Kitty to read his diaries and learn of his past transgressions. The diary included the fact that Tolstoy had fathered a child by a woman who remained on the Yasnaya Polyana estate. In Anne Edwards' Sonya: The Life of Countess Tolstoy, she describes Sophia as having a deep fear that Tolstoy would somehow re-enter a relationship with the other woman. 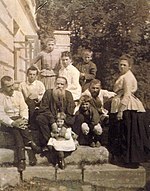 The Tolstoys had 13 children, eight of whom survived childhood. The family was prosperous, owing to Tolstoy's efficient management of his estates and to the sales of his works, making it possible to provide adequately for the family. Sophia acted as copyist of War and Peace, copying and editing the manuscript seven times from beginning to end at home at night by candlelight after the children and servants had gone to bed, using an inkwell pen and sometimes needing a magnifying glass to read her husband's notes. In 1887, Tolstaya took up the relatively new art of photography. She took over a thousand photographs that documented her life, including with Tolstoy, and the decline of the pre-Soviet Russian Empire. She was a diarist and documented her life with Leo Tolstoy in a series of diaries which were published in English translation in the 1980s. Tolstaya wrote her memoirs as well, which she titled My Life. After many years of an increasingly troubled marriage — the couple argued over Tolstoy's desire to give away all his private property — Leo left Sophia abruptly in 1910, aged 82, with their daughter Alexandra, and his doctor, Dushan Makovicki (Dušan Makovický). Tolstoy died 10 days later in a railway station, whilst Sophia was kept away from him (as depicted in the film, The Last Station). Following the death of her husband, Sophia continued to live in Yasnaya Polyana and survived the Russian Revolution in relative peace. She died in 1919.
Who's to blame (Russian: Чья вина? ), Oktyabr 1994/10, 6-59. German Translation: Eine Frage der Schuld, Zürich 2008. Song without Words (Russian: Песня без слов), unpublished in Russia. German Translation: Lied ohne Worte, Zürich 2010. Cathy Porter (tr), The Diaries of Sophia Tolstoy (London: HarperCollins, 2010). She was portrayed by Helen Mirren in the 2009 biographical film, The Last Station, based on the 1990 biographical novel of the same name by Jay Parini, while Leo Tolstoy was portrayed by Christopher Plummer. Both actors were nominated for Academy Awards in their respective categories. Her life was also serialised in August 2010 by BBC's Radio 4 with the title A Simple Life. ^ "The autobiography of Countess Sophie Tolstoi". archive.org. Retrieved 8 October 2010. ^ Feuer, Kathryn B. (1996). Tolstoy and the Genesis of War and Peace. Cornell University PressEdit summary. ISBN 0-8014-1902-6. ^ a b Shonk, Catherine (21 December 2007). "What Mrs Tolstoy Saw". The St. Petersburg Times. ^ Bendavid-Val, Leah (2007). "Song Without Words: The Photographs & Diaries of Countess Sophia Tolstoy". National Geographic. ^ The latest condensed version, The Diaries of Sofia Tolstoy, translated by Cathy Porter, was published by Alma Books, London, in 2009 (ISBN 9781846880803). ^ "Sofja Tolstaja: Eine Frage der Schuld. Manesse Verlag (Gebundenes Buch, Literatur aus Russland und Osteuropa)" (in German). Randomhouse.de. Retrieved 3 October 2012. ^ "Sofja Tolstaja: Lied ohne Worte. Manesse Verlag (Gebundenes Buch, Literatur aus Russland und Osteuropa)" (in German). Randomhouse.de. 23 January 2011. Retrieved 3 October 2012. ^ "Lew Tolstoj - Sofja Tolstaja, Eine Ehe in Briefen von Lew Tolstoj, Sofja Tolstaja - Suhrkamp Insel Bц╪cher Buchdetail" (in German). Suhrkamp.de. 20 September 2010. Archived from the original on 2012-02-29. Retrieved 3 October 2012. ^ Ed Meza (31 March 2008). "Mirren, Plummer to star in 'Station'". Variety. Retrieved 1 January 2016. Wikimedia Commons has media related to Sofia Tolstaya.